An HVAC Design (Manual J) is the first stepping stone of a good comfort system, whether you are installing air conditioning, forced air heating, a radiant heating system, or considering a geothermal system. Any hvac contractor worth his salt knows this, and will perform an hvac design load calculation to determine your home's actual hvac comfort system requirements, before he tries to sell you a system. For too many years, hvac contractors have not been required to perform the proper load calculations before getting a permit from local authorities. Very few building authorities across our country have required any sort of design or sizing justification before a permit was issued. Consequently, the hvac trade has been inundated with "contractors" whose only qualifications seem to be that they could afford the license fees, a white van, and advertising space! The results have been thousands of bad installations, oversized and undersized systems, costing the homeowner dearly on his utility bills. The homeowner has also suffered high frustration levels because his systems don't perform well, and are constantly needing service. Recently, I attended a training session in Salt Lake City, Utah. The room was full of building inspectors there to learn about the new hvac design requirements being implemented. Almost all of the municipalities surrounding SLC are falling in line and requiring a Manual J calculation, a Manual D calculation, a duct layout (schematic), and a gas line design, before a building permit will be issued. Many areas of our Country are now demanding the same, that a proper HVAC design be performed. Whether you are building a new home, or planning a renovation, or even just upgrading to a more efficient hvac system, you may be required to have these calculations performed. California and Florida have long required the proper design calculations be performed due to more stringent building codes. I am hearing daily of other areas, in other states, finally seeing the value in proper hvac design. The days of "Rule of Thumb" design are coming to an end! Hallelujah! Now we just need to start separating the good contractors from those that have no business being in the HVAC business! Your home is probably your single largest investment. You may even want to be warm in the winter and cool in the summer, as you enjoy your leisure time in your home. How unique. Insisting that your Contractor perform and provide a good Manual J calculation, before putting your signature on the dotted line, will help you determine the good guys from the "rule of thumb" hvac companies. Don't take me wrong! There are plenty of good, honest, skilled heating and air conditioning companies out there. The trick is figuring out who is who. Our "Choose a Contractor" page may help you with this chore. Our Philosophy: A quality hvac installation begins with a professional hvac design. The load calculation is where it all begins. If you are a homeowner or a do-it-yourselfer considering a new furnace or adding air conditioning, please contact us for your calculations. If you are a homeowner or builder planning a new home building project, contact us for your calculations and duct designs. If you are an architect wishing to add our services as an option for your prospective clients, contact us to discuss package options. Take a journey through our pages, and the mystical world of HVAC design. We will discuss the benefits of proper load calculations, the hidden, and seldom practiced, secrets of proper duct design, humidification, and the benefits of indoor air quality. 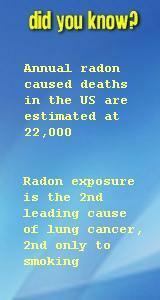 We will discuss the dangers, to yourself and your family, of "indoor air pollution" and options/remedies. We will look at "Swamp Coolers vs. Conventional Air Conditioning". We will take a look at ventilation for your home, air cleaners, radiant heated floors, zone systems, furnaces, air conditioning, infrared room and space heaters, heat pumps, and more. Then, please take a minute or two to visit our Green pages. Here you will learn about highly efficient hvac equipment, and how your installation costs can be offset by rebates, tax credits, along with lower operating costs. This site is meant to touch upon all things HVAC, with a special emphasis on Manual J calculations, Manual D calculations, proper duct design, and the importance of you, the consumer, requiring that your Contractor perform these load calculations, before signing a contract with any Heating and Air Conditioning contractor. It is not our intentions, in these pages to make you an hvac expert, but to give you the ammunition to ensure that the comfort system you desire and pay for, is truly the system you receive. We hope to strip away all of the technical jargon, and get down to the basics. You don't need to be a "rocket scientist" to have a perfect home comfort system. You don't need to know the boiling point of R22 refrigerant, or how a thermal expansion valve works, to have an economical/efficient, well functioning air conditioner in your home. You don't need to understand your ductwork static pressure in order to have a good furnace system and a well balanced duct system that delivers the proper air flow into each room of your home. On our journey of discovery, we may even stumble upon seldom travelled paths leading to SAVINGS! So, pull on your hiking boots and join me on the road to perfect home hvac design. Our services include Manual J calculations, Manual D duct designs, easy to follow duct schematics, and gas line schematics. Contact us about our HVAC design services, Manual J calculations, Manual D calculations, Duct designs, or load calculations, by e-mail or by phone. Fill out and submit our HVAC design questionaire before your design work can begin. Manual J calculations and Manual D calculations are the stepping stones for good comfort systems. Check out our hvac design prices! Submit this order form to have your HVAC design calculations, Manual J calculations, Manual D calculations, and Duct designs professionally prepared. Hvac Design: The most important step before or during a comfort system purchase. The Hvac Design is first. Purchasing a comfort system installation can be a mind boggeling decision for anyone. ACCA Manual J calculations are the industry standard for the proper design and installation of an hvac system that will perform well in your home. Trust the results. We use Wrightsoft Universal for our hvac design software. Swamp coolers, also known as evaporative coolers, are an economical option for cooling your home. Traditional forced air furnaces are still the most economical and dependable sources of heat for your home. Radiant heating or hydronic floor heating can be economical to run, and the most comfortable type of heating system for your home. Installation of a geothermal hvac system for your home is not only environmentally responsible, but is the most efficient type of comfort system available today! Air handlers can deliver ventilation, better indoor air quality, heating, air conditioning, and humidification to your home. Discover SAVINGS! 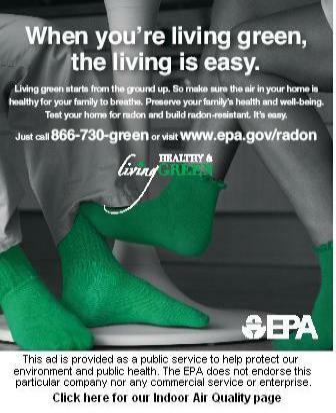 Rebates and tax credits for installing energy efficient air conditioners and furnaces. Although still rare, the residential chilled water air conditioning system can be a viable option to cool your home. This page provides links to our Green Pages. Choosing Green when choosing a comfort system will fatten your wallet and help Mother Earth! Heat pumps can be an efficient method for heating your home, especially as a major component in a dual-fuel system. Choosing a competent hvac contractor is one of the most challenging and important decisions you must make for your home. HUMIDIFICATION: It's a Comfort Issue! Humidification is a comfort issue. Some folks can't live without it, others hardly notice humidity. Here we will look at the three most common types of humidification. A dampered hvac zoning system will provide separate thermostatic control for different areas of your home, at different times of the day. Indoor air quality begins with a good air cleaner or purifier. Outdoor air introduced into your home can greatly enhance your comfort and health. High efficiency air filtration and air cleaning will reduce the airborne pollutants threatening the health of your family in your home. Energy efficient tips are provided here to help guide the Homeowner through the high efficiency hvac equipment jungle. This hvac quick tips page directs you to quick answers and references to many sought after hvac subjects. Achieving proper duct design can be accomplished by following ACCA Manual J and ACCA Manual D procedures. This do it yourself hvac section will give you the basics of a sheet metal hvac installation. 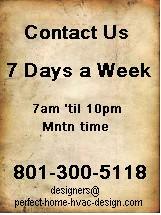 This is a project that you can save money on your home. We welcome authors for our hvac article submission page. We will post your hvac related article with your credits linked to the most relevant page. Read here our customer comments and testimonials. Customer satisfaction with our Hvac designs is achieved only through dedication and attention to detail. 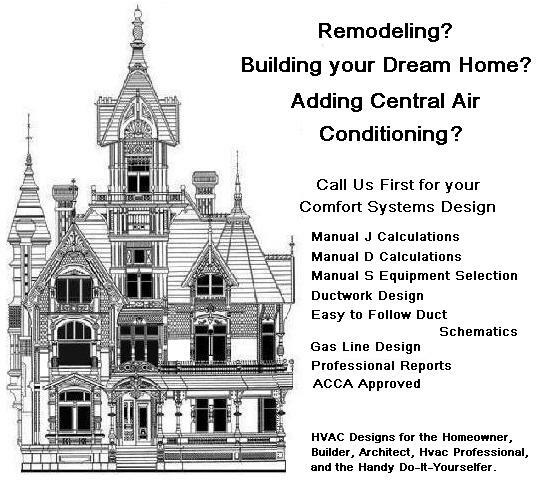 Proper Design For Your Next Hvac Project! Promoting the importance of proper hvac load calculations before you embark on an hvac purchase. This hvac design sbi testimonial page relates my experience building an SBI! website and why I promote Site Build It. List of all site pages, where they link from for site navigation. A window air conditioning unit can be the solution to cooling your older home if retrofitting a conventional air conditioner is unrealistic or expensive.